Being a 24/7 caregiver to her stepfather, Pat Bolin was at the point of screaming – the stress was so intense. And then she found Mindful Care Adult Day Services. Now, two days a week, she can get some rest and tend to her own needs and responsibilities. Austin Eugene Manire, or “Doc,” as he has been pegged for most of his 94 years, is a veteran of World War II. He started showing symptoms of Alzheimer’s disease in 2007 shortly before his second wife (Pat’s mother) passed away. Doc was born in Rutherford County in a small area called Bunker Hill, just outside of Rover and Eagleville, where he lived most of his life. When Doc was a child, he and his siblings and neighborhood friends played doctor. (Doc was in the middle between seven brothers and two sisters.) One might guess who was always the doctor. One of his neighborhood friends started calling him “Doc,” and it caught on. When Doc was 17, he joined the Civilian Conservation Corps, which was founded by the government to create jobs. 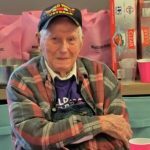 He was working in Oregon when the Japanese bombed Pearl Harbor, and they immediately sent all the boys home. Doc wasn’t home too long before he received a letter of invitation from Uncle Sam. “Doc was inducted into the service in March 1943 at Camp Forrest in Tullahoma. As an infantryman, he was sent to Fort Jackson.” Pat noted. “He was fortunate enough to be pulled from there and sent overseas as a replacement, because the 106th Infantry was pretty much wiped out later on. “He was sent to Algiers where he served with Military Intelligence. They went through Italy and France and eventually ended up in Germany. Doc engaged in combat at the Battle of the Bulge, picking up prisoners from there to return for interrogation,” Pat recounted. “I’ve known Doc since I was about 8 or 9 years old,” Pat recalled. “My mother was married to my father, and Doc was married to his first wife. The two families would often get together and play Rook. Over a period of years, both of them divorced their spouses. In 1970, Doc and my mother were married, and he moved from where he was living to my mother’s farm,” Pat said. “Doc has always been a very simple and honest man,” Pat noted. “He’s the only man I’ve ever known who never bought or rented his own house. He worked for people and lived on the property, cutting wood, fixing fences building barns and farming the land. Before he moved to my mother’s farm, he lived in his brother’s house, who lived out of state, and took care of his farm. He raised a family there, despite the fact that there was no electricity and no running water. In 2007, Pat’s family noticed Doc’s behavior was changing. He was showing signs of dementia. Pat remembers a picture of a seascape that Doc painted at Mindful Care. “The picture was quite good, and the family was impressed,” she recalled. “He treated me like one of the boys,” Pat said. “One of my favorite memories of Doc is him sitting on a tractor with grease on his face, wearing a felt hat and a big grin. He liked to play tricks on people. He used to tell me about his dog Spot. Of course, there was no dog named Spot.